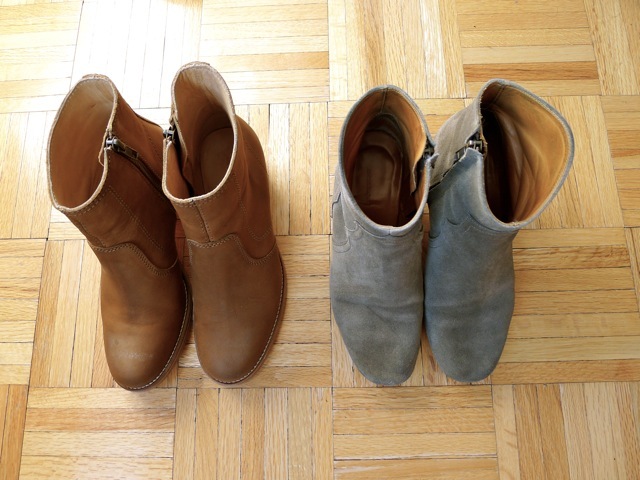 a reader got in touch recently asking about how to pre-treat her new A.P.C. boots (i reviewed mine here) before wearing them. i got the nougatine (beigey-brown) version of the boots. all i did prior to wearing was spraying them with a coat of Collonil, and they're pretty much good to go. the spray dried quickly, and didn't darken the nubuck. as for continuing maintenance, i use a quick polish sponge to get out marks and scuffs on the nubuck, and the suede brush and block are my go-tos for getting out occasional dirt or scuffs on my suede Dickers. as for handbag care, i also sprayed my tobacco suede PS1 with two coats of Collonil, and this did darken the suede ever so slightly (actually i like this 'warmed' color better, it brings out a richer dimension of the tobacco color!). since then, i've been caught out in the rain with it several times, and raindrops just rolled right off and dried without leaving any marks. i use the leather gel primarily to recondition and keep the leathers of my handbags supple, though i also use it to recondition the uppers on my tall boots (ie: the Loeffler Randalls). 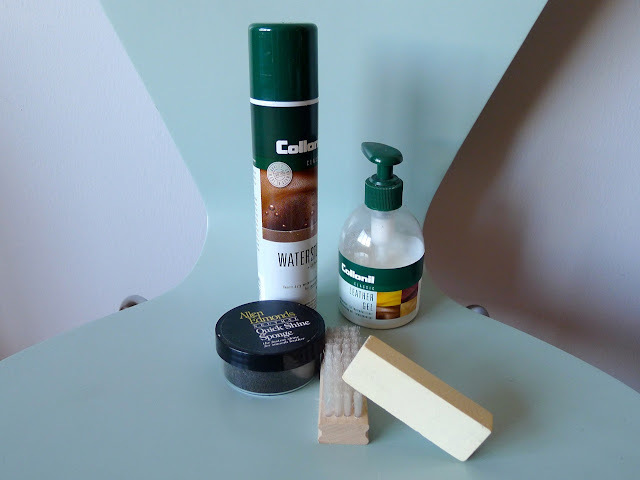 for more on shoe care and maintenance, see my detailed post here. as for dye-transfer: i haven't really had issues with denim dye on the exterior uppers of my lighter-colored shoes and boots. however, the interior linings of my dickers do have some bluish marks from where i tuck my jeans in. as it's on the inside of the shoe, i don't really mind. hope this helps! what are your workhorse shoes? do you have a care/maintenance method? salt and snow...the enemies of fine footwear! this was very useful. thanks sophie! I wish I'd scotchguard my boots and sneakers before wearing them with dark denim. I'll have to check out Collonil. I've never heard of it before.